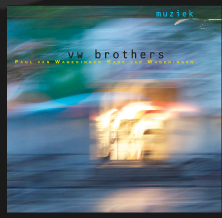 The Brothers are quite impressive musicians and Marc contributes the bulk of the original music. Well-produced, "Muziek" makes for good, if not essential, listening. For more information, go to www.vwbrothers.com. 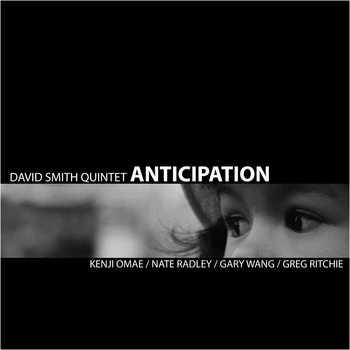 Anticipation - David Smith Quintet (BJU Records) - Brooklyn Jazz Underground Records keeps releasing fine recordings by younger musicians who have settled into the city in the shadows of Manhattan. Smith, a Canadian-born trumpeter with a clean sound and knack for writing good melodies, is a busy musician, working with ensembles of varying sizes ranging from Darcy James Argue's 18-member Secret Society to Harry Connick's Band to the quartet he co-leads with flautist Jamie Baum. This, his second release as a leader, features the solid rhythm section of Gary Wang (bass) and Greg Ritchie (drums), the strong guitar work of Nate Radley and a front line of Smith's trumpet and Kenji Omae (tenor saxophone). The sound of this ensemble and several of the arrangements are reminiscent of bassist Ben Allison's recent groups - one hears it in the blending of trumpet and saxophone and the use of the guitar. That said, it's not hard to be seduced by the classical opening and swinging solo sections of Radley's "Carillon" or the rockish intent of Smith's subtly powerful "Bittersweet." The latter tune rides atop Ritchie's pounding drums but there is plenty of dynamic variety and a melodic line that has the trumpet and saxophone playing lines that weave in and out. Other highlights feature the high-energy romp through John Coltrane's "Satellite" ( great drum and rhythm guitar work),, the medium-tempo blues "The Question" with its melody line that reminds this listener of Andrew Hill and the long (10 minute +) multi-sectioned "Alone" that close the program. Smith's trumpet work is impressive throughout - there are moments when his fluid playing hearkens back to the work of Clifford Brown and the classical playing of Wynton Marsalis. Omae is more subdued player yet displays a melodic side and is a perfect sonic fit for the trumpet. "Anticipation" has grown on me with each listen - there's a maturity and a sense of exploration that one might not hear the first time through but give this CD multiple listens and its rewards are bountiful. For more information, go to www.davesmithtrumpet.com. Motherless Child - John Blake Jr. Quartet w/Mulgrew Miller, Evelyn Simpson-Curenton & Afro Blue (ARC) -From the opening seconds of the title track, with Blake's expressive violin in unison with the vocals of Afro Blue (the Howard University Jazz Choir), this CD is a joy to hear. Blake is such an expressive player and he can rise up with ease, playing vocal-like phrases filled with cries and laughter. The rhythm section of Boris Kozlov (bass) and son Johnathan (drums) really drives this music and there is hearty piano work from Mulgrew Miller (2 tracks), Sumi Tonooka (4 tracks) and Ms. Simpson-Curenton who displays impressive "chops" on "A Balm in Gilead." The 10-member Afro Blue on 6 of the 9 tracks and have fine voices - check out the wordless vocals of Reginald Bowens on "I Want Jesus To Walk With Me"and alto Christie Dashiell on "Steal Away", and the handsome baritone of Brian Lawson and lovely soprano of Danielle Withers on the unaccompanied "Nobody Knows" that closes the CD. The classy vocal arrangement, Blake's soaring violin solo, Tonooka's fine piano work and Johnathan Blake's sensuous drum patterns makes the very funky "Hold On" hard to resist. John Blake Jr. has always been a good player, blending myriad jazz and blues influences into his playing. This music is so joyous, so well-played and sung that my only criticism is that the program could be longer. For more information, go to www.johnblakejr.com. 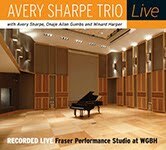 Live - Avery Sharpe Trio (JKNM Records) - Bassist Sharpe, a veteran of many jazz ensembles but, most notably, spent 2 decades underpinning the music of pianist McCoy Tyner. "Live" is his 8th release as a leader and features the sparkling piano work of Onaje Allan Gumbs and the forceful percussion of Winard Harper, both long-time associates. The results of the Trio's August 15, 2008, trip to the studios of WGBH-FM in Boston are quite enjoyable. The group is oh-so-tight, Gumbs is a fine soloist and the rhythm section knows just what to play. They are all fine soloists. Sharpe is quite musical and technically adept (note his jaunty solo on his composition "Oh No!") He gets "I Understand" all to himself and, as to be expected, it's a tour-de-force. Harper shines throughout, whether pushing the tempo and prodding the soloists on Yusef Lateef's "Morning" (which also features excellent arco work from Sharpe) or controlling the dynamics as he does on Gumb's "Morning Glow." The pianist never falters, whether he flying through the changes of "My Favorite Things" or high-stepping through "Blues on the Corner." Only 44 minutes long, "Live" is a satisfying musical experience. The Trio doesn't "push the envelope" as much as "nudge it" while bathing the listener in sweet sounds. For more information, go to www.averysharpe.com. Special "shout out!" to photographer Maurice D. Robertson from Hartford whose portraits of the Trio grace the CD jacket. Robertson is also the long-time host of "Accent on Creative Music", heard every Wednesday from 9 p.m. - 12midnight on WWUH-FM and online at www.wwuh.org. A generous collection of his images are on display through the summer at the Artists Collective, 1200 Albany Avenue in Hartford. For more information, go to http://artistscollective.org/events.htm. surge of Rakalam Bob Moses (drum set) and Tupac Mantilla (percussion). The blend of Landrus' baritone with the bruising tenor sax of George Garzone and the smooth tones of alto saxophonist Allan Chase is immediately appealing - the solos are short but arresting. Landrus moves to bass clarinet for the "freer" yet intense "Shadows", also notable for the excellent percussion and pianist Michael Cain's contributions. All the tunes are Landrus originals, save for the opening track "Ask Me Now" (from Thelonious Monk.) That cut has a delightful swing feel, thanks to Moses' fine brush work and Cain's classy piano interjections and solo. "To Love and Grow" is a handsome ballad, with Landrus on flute (he displays a lovely tone), more fine brush work from Moses and a light, fleet-fingered piano solo. The influence of John Coltrane's "Africa" permeates the feel of "The Stream", with another strong workout from Garzone followed by the "controlled burn" of Landrus' baritone solo - also take note of the inspired interaction between Lockwood and the percussionists throughout the solo section. The passionate latin-influenced drive of "Classification"has a similar feel as the previous cut but Landrus' baritone solo really takes flight. The CD closes with "Destination", a group improvisation that is more delicate than noisy, with good trumpet work from Jason Palmer and a quiet percussion close. A gentle touch down for a program that more than satisfies the curious listener. Brian Landrus has good composing skills and he plays with a maturity that belies his 29 years (at the time of the recording). I look forward to his future endeavors. For more information, go to www.brianlandrus.com.